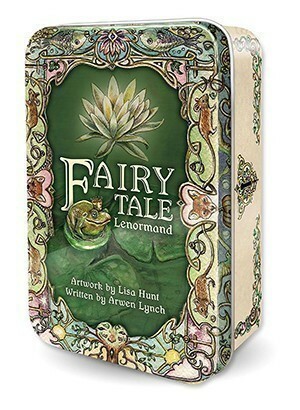 The Fairy Tale Lenormand by Lisa Hunt is a delightfully charming deck. Stemming from Lisa Hunt’s long interest in fairy tales (The Fairy Tale Tarot is also one of her creations), she painted the delicately soft watercolor images and Arwen Lynch wrote the accompanyin g guidebook. Published by US Games Systems, Inc, The Fairy Tale Lenormand immediately joined the ranks of my favorite Lenormand decks. Scenes are depicted in soft, yet bright watercolor paintings that are intricate and highly detailed. The style is long familiar to fans of Lisa Hunt’s tarot decks. Hidden faces in clouds and rocks, intricately latticed tree roots and branches, along with tremendous attention to the finer details makes The Fairy Tale Lenormand a feast for the eyes. The cards measure 3 1/2 x 2 1/4″ with a light tan border containing muted scrollwork. Card numbers appear in the upper left-hand corner. Card titles and playing card associations are centered at the base of the card. The accompanying guidebook is the same size as the cards. As it is quite small one would expect just a simple LWB (Little White Book, basically a pamphlet often found with tarot decks), but instead we are treated to an actual Lenormand card-size paperback book with an actual spine. The guidebook contains 124 pages. The fairy tale that is the inspiration behind each card is briefly summarized. Keywords and a general meaning are provided for each card. The guidebook concludes with several spreads: several examples of a Fan Spread using a focus card plus 3 additional cards, a 12-card Crossroads Spread, a 16-card Tower Spread, and a 12-card Happily Ever Afters Spread. This guidebook does not go into the longer Grand Tableau spread due to space constrictions, but a discussion of the Grand Tableau can be found in any number of new Lenormand books out on the market. The Fairy Tale Lenormand comes housed in a lovely tin box. Lisa Hunt created artwork specifically for the box, which is decorated on all six surfaces. This set of deck and guidebook make for a very lovely presentation. The tin box provided sturdy and completely secure storage for the cards that allows for ease of travel. It’s a lovely little kit that I am sure any Lenormand reader would love. If you’d like to see every card, please click on my YouTube video review of The Fairy Tale Lenormand. This is my VERY FIRST video deck review. I also invite you to view the other videos on my YouTube channel and subscribe if you like. There is plenty more to come. The Complete Lenormand Oracle Handbook: Reading the Language and Symbols of the Cards by Caitlin Matthews. Full Disclosure: I received a copy of this deck from the publisher to be considered for review. I only review those decks I consider to be of interest to my followers.